REMOVAL OF ANOMALIES IN PENSIONS . (c) if not, by when that is likely to be done? (a) to (c) : In accordance with the orders issued in implementation of the recommendations of the 6th Central Pay Commission for revision of pension of Central Government Civil Pensioners with effect from 01.01.2006, all pre-2006 pensioners would get a minimum increase of 40% of their pre-2006 basic pension (excluding the element of merged dearness relief/dearness pension), in addition to the basic pension, dearness pension and dearness relief which they were getting as on 01.01.2006 based on their pre-revised pension. Besides, the revised pension will, in no case, be lower than fifty percent of the minimum of the pay in the pay band plus the grade pay (in the case of HAG and above scales, fifty percent of the minimum of the revised pay scale) corresponding to the pre-revised pay scale from which the pensioner had retired. These orders are consistent with the recommendations of the 6th Central Pay Commission and no change has been considered necessary by the Government in this respect. The Central Government has launched a new Central Scheme to provide full interest subsidy during the period of moratorium on educational loans for students belonging to economically weaker sections (with parental family income from all sources of less than Rs.4.5 lakh annually) from scheduled banks under the Educational Loan Scheme of the Indian Banks’ Association (IBA) for pursuing courses of studies in professional/technical streams from recognized institutions in India. The Scheme is effective for all IBA approved educational loans sanctioned to eligible students in respect of courses of studies in technical and professional streams from recognized institutions in India, from the academic year 2009-10. This Scheme is an overlay of the existing IBA Education Loan Scheme. The modalities have been finalized in consultation with the Indian Banks’ Association and circulated to all member banks for implementation. Under the Scheme, proof of income is required to be certified by authorities to be designated by the State Governments. Accordingly, the Ministry has written to all Chief Secretaries of States/Union Territories to intimate the designated authority / authorities (at the District/Sub-District/Block, etc. levels) to the District Level Consultative Committee (DLCC) so that banking authorities at the branch level where students would be approaching for availing the benefit of the scheme would be aware of the same. Eligible students who wish to avail of the benefits of the Scheme can approach the respective bank branch from where they availed of the education loan and complete the necessary formalities including obtaining the certification in respect of annual family income from the competent authority at the Block/Tehsil/District Level, so that the individual student accounts could be credited with the interest due on the loan for the academic year 2009-10 onwards. Canara Bank is the nodal Bank, for the member Banks of IBA, for claiming reimbursement of interest credited to student accounts. The details of the Scheme as well as the above communications are available on the website of this Ministry at www.education.nic.in. The Scheme is effective from 1.4.2009. In unusual self-criticism, the Supreme Court said today that courts, including the “last court in the largest democracy of the world”, have lost sympathy for the common man in pursuit of the “attractive mantras” of globalisation and liberalisation. A Division Bench of Justice G S Singhvi and Justice A K Ganguly, in two separate orders, cautioned judges of the Supreme Court and Constitutional courts that there will be “precarious consequences” will visit the nation if they dilute constitutional imperatives to promote the “so-called trends of globalisation”. Both judges passed their orders on January 5 in an appeal filed by Harjinder Singh, a retrenched worker with the Punjab State Warehousing Corporation, who had challenged the Punjab and Haryana High Court decision to pay him Rs 87,582 as compensation instead of re-instating him with 50 per cent back wages. The judges set aside the High Court order and called for his re-instatement with 50 per cent back wages and cost of Rs 25,000. Justice Ganguly quoted Rabindranath Tagore in his order when he described the “eventualities which may visit us in our mad rush to ape western ways of life”. His brother judge on the Bench, Justice Singhvi, observed how he had noticed a “visible shift” generally in the courts’ approach in dealing with cases involving the interpretation of social welfare legislation like the Industrial Disputes Act. “The attractive mantras of globalisation and liberalisation are fast becoming the raison d’etre of the judicial process and an impression has been created that the constitutional courts are no longer sympathetic towards the plight of industrial and unorganised workers,” Justice Singhvi said in his order. “Judges of this Court are not mere phonographic recorders but empirical scientists and interpreters of the social context in which they work,” said Justice Ganguly. “I am in entire agreement with the view of my Lord Brother Justice Singhvi about a disturbing contrary trend which is discernible in recent times and which is sought to justified in the name of globalisation and liberalization of economy,” said Justice Ganguly. “Our Constitution is primarily shaped and moulded for the common man. It takes no account of the ‘portly presence of the potentates, goodly in girth’. It is a Constitution not meant for the ruler, but the ranker, the tramp on the road, the slave, the man with too weighty a burden, too weary a load,” said Justice Ganguly, quoting eminent jurist N A Palkhivala. Justice Ganguly said the “ditches” created in the society by the advance of globalisation can only be overcome if “this Court makes an effort to protect the rights of the weaker sections of the society as per the Constitutional mandate”. “Judges and specifically the judges of the highest court have a vital role to ensure that the promise (to secure all citizens justice, liberty, equality and fraternity) is fulfilled. If judges fail to discharge their duty, they fail to uphold and abide by the Constitution which is their oath and office... Judges of the last court in the largest democracy of the world have a duty to articulate the Constitutional goal,” the Bench said. National Building Construction Corporation (NBCC) is launching a massive scheme for affordable housing in major cities, including the NCR, on Wednesday. At a time when private builders and developers are reeling under the impact of the global economic downturn, NBCC’s scheme is likely to be quite popular as it offers three/four bedroom flats in a price band of Rs 25-45 lakh. Under the scheme, the PSU will offer around 1,300 houses in the first phase in NCR — Gurgaon, Noida and Ghaziabad. According to Arup Roy Chaudhury, CMD, NBCC, the flats will have all modern facilities. The specifications will be at par with those offered by private builders. Sources pointed out that NBCC is also contemplating creation of separate enclaves for plotted development, including town houses and villas, in an affordable price range in NCR, most likely in Ghaziabad. An official said the scheme will initially be open to government, state and central public sector employees and later extended to the public. ‘‘We are keeping our promise to deliver affordable housing in the Capital and NCR region and also in other cities like Kolkata, Kochi and Patna,’’ the NBCC chief told TOI. Sources in NBCC said land is now being acquired for the purpose in Delhi, Gurgaon and Noida. Also, the agency is keen to buy five other plots at a reserved price offered under the group housing scheme for which the Noida Authority failed to find private players. As the realty sector is badly hit by the economic downturn, providing affordable housing in Delhi and the NCR has become the top priority for private and public sector real estate developers. The PSU, which has registered a high profit, is also likely to launch similar scheme in other cities like Kochi, Patna and Kolkata. ‘‘Housing at affordable prices has been made possible by NBCC due to its adoption of forward costing method and a transparent mechanism by clearly identifying the super area loading so that any individual buyer is not confused by these issues while booking a house or flat,’’ Chaudhary said. New Delhi, the dated 30th March, 2010. It has come to the notice of this Department that fake orders on revised rate of Overtime Allowance are being circulated in Central Govt.offices. It has been confirmed from Ministry of Finance that the O.M. No.1 (4)/2010 E-II dt.27/3/2010 signed by Sh. S. Rajan Chandranaydu,Under Secretary to the Govt. of India purportedly issued by Ministry of Finance is fake. It is clarified that no such instruction has been issued by this Department or Ministry of Finance. Ministries/Departments are advised not to take cognizance of the fake instructions being circulated in Central Govt. Offices . Appealing to ex-servicemen not to take the extreme step of returning their gallantry awards, government today said it has started implementing recommendations of the high level panel on One-Rank One-Pension. However, Defence Minister A K Antony said in the Rajya Sabha that implementing the award in one go was difficult. "In one stretch, we will not be able to implement it but we are near that goal... it is a long process," he said. He said the government has implemented all recommendations of the committee headed by the Cabinet Secretary which went into the demands for One-Rank One-Pension. This would have a financial implication of Rs 2,200 crore and would help 12 lakh ex-servicemen, he said. Main aspects of one-rank one-pension addressed: Govt. With ex-servicemen protesting over the one-rank one-pension issue, Government has said the main aspects of the demand have already been addressed which are benefitting around 12 lakh personnel. "The main aspects have already been addressed in-principle and there has been a substantial addressing of the issue and I think 12 lakh personnel below officer rank have benefitted because of these decisions," Minister of State for Defence M M Pallam Raju said in New Delhi on Tuesday. Ex-servicemen have been demanding equal pension for personnel retiring from the same rank irrespective of their date of retirement. Persons retiring before the pay commission cut-off date get lesser pension than those retiring after that date. Recently, while replying to a Parliamentary query, Raju had stated that government had accepted several recommendations of a Committee looking into the 'one rank one pension' demand to improve benefits of armed forces pensioners. Among the recommendations were revision of Lt Generals' pension after carving out a separate pay scale for them and bringing parity between pension of pre- and post-October 10, 1997 for pensioners of personnel below officer rank. Fifth Pay Commission was implemented on that day. He had said that around 12 lakh pensioners have benefitted by the government's decisions. In a pioneering initiative and first of its kind in Central Government Health Scheme(CGHS), Minister of Health and Family Welfare Shri Ghulam Nabi Azad will inaugurate a standalone haemodialysis centre at Sadiq Nagar CGHS Wellness centre, here tomorrow. This pilot project shall be a testing pad in CGHS before such units are rolled out at District Level under the National Program for control of Diabetes. This is being started as a pilot project in collaboration with M/S Alliance Medicorp (India) Limited, Chennai a JV company of Apollo Health and Lifestyle Ltd. (Apollo Group of Hospitals) under Public Private partnership. Secretary (Health) Ms K Sujatha Rao, Director General Health Services Dr R K Shrivastava and Chairman Apollo group Sh Pratap Chander Reddy will be present on the occasion. Currently in India dialysis units are set up within hospitals mainly due to shortage of nephrologists leading to scarcity of dialysis units. CGHS beneficiaries often suffer hardship for dialysis as demand far exceeds the supply. CGHS refers quite a few of its beneficiaries to private empanelled hospitals. In Delhi around 40 – 50 patients require dialysis per day. Further in years to come, need for dialysis is likely to go up in view of prevalent diseases like diabetes and hypertension which lead to chronic Kidney disease and renal failure. Therefore Public Health sector shall have to cater to significantly increased demand for dialysis and concept of standalone dialysis has been looked into for meeting this demand. In this model dialysis unit is not located in a hospital and therefore eliminating the need of availability of Nephrologist round the clock as Dialysis station is manned by trained medical and paramedical staff under the overall supervision of Nephrologists who ensure quality control as per laid down protocol. Without exploring the possibility of commissioning standalone dialysis units it may never be possible to meet this demand . While identifying a private partner Apollo Hospitals scored better in overall support mechanism of Nephrologist, Human Resources, Referral, Complications Management, Performance Report and Grievance Redressal. Chronic renal failure is a disease where patient’s kidneys are either compromised or stop functioning and are unable to clear toxic wastes from the body. Dialysis is regarded as a "holding measure" until a renal transplant can be performed, or sometimes as the only lifelong supportive measure in those for whom a transplant would be inappropriate. A space of 2400 sq. ft. covered area has been renovated to suit the requirements for providing state of art dialysis facility .It shall have a capacity to dialyze up to 21 cases of Chronic Renal Failure per day with seven functional Dialysis machines (and an additional stand by machine) and shall be operational from 7 A.M. to 8 P.M. for 310 days in a year. If maximally utilized it shall be able to undertake 6510 dialysis per year. Dialysis machine works on the principle of the diffusion (Waste removal) of solutes and ultra filtration(Fluid Removal) across a semi permeable membrane .a thin layer of material that contains various sized holes, or pores through which smaller solutes and fluid pass through but blood cells, and large proteins can’t). Substances in water tend to move from an area of high concentration to an area of low concentration Blood flows by one side of a semi-permeable membrane, and a dialysate (dialysis fluid), flows by the opposite side .this counter current being beneficial for removal of urea and creatinine accumulation of which in blood are life threatening. This joint venture would fruitfully cater to the need of maintenance haemodialysis of CGHS beneficiaries by in house management of such patients. This center would be extremely beneficial to CGHS patients of chronic renal failure by providing timely haemodialysis and mitigate suffering thereby improving the quality of life and productivity. This center shall also reduce dependence of CGHS on private empanelled hospitals and government hospitals. Struggling to meet the deadline of introducing a much awaited tax reforms bill, the Cabinet is likely to consider the Direct Taxes Code on Thursday, a move aimed at rationalising rates and improving tax compliance. A proposal is before the Union Cabinet for consideration and passage of the DTC Bill, a source told PTI. The government plans to introduce DTC, which will replace the archaic Income Tax Act, from next fiscal. The government is, however, unlikely to meet the deadline for introduction of yet another important piece of tax reforms - the Goods and Services Tax. If introduced in the monsoon session that ends on August 31, the DTC Bill is expected to be referred to a Parliamentary Standing Committee on finance and may be passed during the winter session to make the reforms effective from the deadline -- April 1, next year. Sub: Admissibility of full pension to Railway servants retiring on or after 01.01.2006 - regarding. Clarifications are being sought from this office by the Zonal Railway Administrations in connection with the revised instructions issued by the Department of Pension and Pensioners' Welfare regarding grant of full pension to Government servants retiring on or after 01.01.2006, and its applicability to those employees who are absorbed in Public Sector Undertakings/Autonomous bodies. 2. It is informed that the Department of Pension and Pensioners' Welfare, vide their O.M. dated 10.12.2009, circulated on the Zonal Railways etc. vide this office letter of even number dated 15.12.2009, has dispensed with the linkage of full pension with 33 years of qualifying service with effect from 01.01.2006, instead of the earlier to pension cut off date of 02.09.2008. As such, all employees becoming entitled to pension on completion of 10 years of qualifying service in accordance with Rule 69(2) of the Railway Service (Pension) Rules, 1993, on or after 01.01.2006, are eligible for pension equal to 50% of the emoluments or average emoluments, whichever is more beneficial to them. With the issue of these instructions, the concept of pro-rata pension has ceased to exist with effect from 1.1.2006. This provision is equally to those employees who have been permanently absorbed in PSUs/Autonomous Bodies and have since become entitled to monthly pension in terms of the extant instructions. 3. All the Zonal Railways etc. are, therefore, advised to settle the pending cases accordingly. Government introduce a new Medical Scheme for Central Government Employees and Pensioners as in the name of Central Government Employees and Pensioners Health Insurance Scheme (CGEPHIS). In all over India, pensioners are getting meager amount of Rs.100 as Medical Allowance (except CGHS beneficiaries). It is estimated that approximately 17 lakh serving employees and 7 lakh pensioners shall be offered this Scheme and Government plan to enroll all serving employees and pensioners on compulsory / optional basis. CGEPHIS shall be compulsory to new Central Government Employees who would be joining service after the introduction of the Health Insurance Scheme. CGEPHIS shall be compulsory to new Central Government retirees who would be retiring from the service after the introduction of the Insurance Scheme. Existing Central Government Employees and Pensioners who are already CGHS beneficiaries. In this case they have to opt out of CGHS scheme. They will also have the option of choosing both CGHS and Insurance policy. In such case the total insurance premium has to be borne by the member. In-patient benefits – The Insurance Scheme shall pay all expenses incurred in course of medical treatment availed of by the beneficiaries in an Empanelled Hospitals/ Nursing Homes (24 hours admission clause) within the country, arising out of either illness/disease/injury and or sickness. NOTE: In case of organ transplant, the expenses incurred for the Donor are also payable under the scheme. Pre & Post hospitalization benefit: Benefit up to 30 days Pre Hospitalization & up to 60 days Post Hospitalization respectively which would cover all expenses related to treatment of the sickness for which hospitalization was done. Serving/Retired Employees: Self, Spouse, Two dependent children and up to Two Dependent Parents. New born shall be considered insured from day one till the expiry of the current policy irrespective of the number of members covered subject to eligibility under maternity benefit. Any additional dependent member in addition to above [Sr. No. 5 (1)] can be covered under the Scheme by paying the fixed amount of premium. This additional full premium shall be borne by the beneficiary. Beneficiaries shall be identified by a “Photo Smart Card” issued by the insurer to all beneficiaries which would have all personal details, medical history, policy limits etc. of the CGEPHIS members. This card would be used across the country to access Health Insurance Benefits. The photograph embedded in the chip of the Smart Card will be taken as the proof for determining the eligibility of the beneficiaries. The Scheme shall provide coverage for meeting all expenses relating to hospitalization of beneficiary members up to Rs. 5, 00,000/- per family per year in any of the Empanelled Hospital/Nursing Home/Day Care Unit subject to stated limits on cashless basis through smart cards. The benefit shall be available to each and every member of the family on floater basis i.e. the total reimbursement of Rs. 5.00 lakh can be availed by one individual or collectively by all members of the family. The services have to be provided by the Empanelled Hospitals/Nursing Homes/Day Care Clinics to the beneficiary based on Photo Smart Card authentication only without any delay. The beneficiaries shall be provided treatment free of cost for all such ailments covered under the Scheme within the limits/sub-limits of defined package rates and sum insured, i.e., not specifically excluded under the scheme. 1. Departments and offices will call for options from employees to join voluntary CGEPHIS with or without existing CGHS/CS (MA) benefits. 2. Head of Department of the Administrative Ministry/Department would be the contact point for the Insurance Companies. 3. Enrolment forms giving details about self and family and authorization to the department for recovery of premium on a monthly basis would be consolidated by the Administrative Ministry / Department. The data of the beneficiary and dependent members to be covered along with 2 recent passport size photo and copy of enrolment form will be forwarded to Insurance Company on monthly basis. 4. Insurance Company will issue Smart Cards on the basis of information received of the beneficiaries for enrolment. 5. Such Smart Cards along with the enrollment kit shall be sent by the insurers directly to the insured persons at their respective mailing addresses at insurer’s cost within 7 days. The beneficiary will have to pay an annual premium which will be determined after the formal introduction of the Scheme. It will vary according to the grade pay of the officer. The estimated annual premium for a standard family size will be in the range of Rs.8000 to Rs.12000 p.a. It is however proposed to be subsidized by the Government to a considerable extent. Subject: Applicability of minimum pay/stepping up of pay clarification reg. A number of references have been received in this office regarding applicability, for departmental promotees, of minimum entry pay prescribed for direct recruits (appointed on or after 1.1.2006), in Section II of Part A of the First Schedule of RS(RP) Rules, 2008. References have also been received regarding stepping up of pay of senior promotees with references to such of their directly recruited juniors who are recruited on or after 1.1.2006 and whose basic pay is more than that of their seniors. 2. The matter has been examined in consultation with Ministry of Finance. 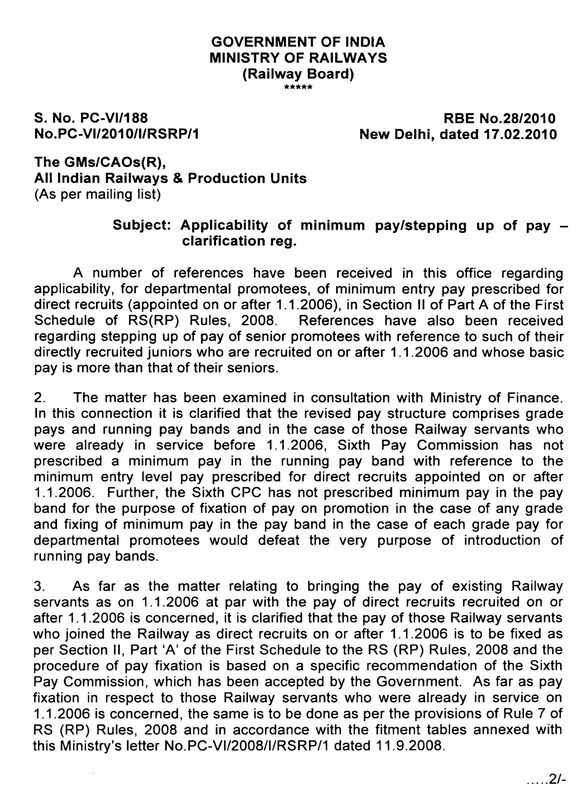 In this connection it is clarified that the revised pay structure comprises grade pays and running pay bands and in the case of those Railway servants who were already in service before 1.1.2006. Sixth Pay Commission has not prescribed a minimum pay in the running pay band with reference to the minimum entry level pay prescribed for direct recruits appointed on or after 1.1.2006. Further, the Sixth CPC has not prescribed minimum pay in the pay band for the purpose of fixation of pay on promotion in the case of any grade and fixing of minimum pay in the pay band in the case of each grade pay for departmental promotees would defeat the very purpose of introduction of running pay bands. 3. As far as the matter relating to bringing the pay of existing Railway servants as on 1.1.2006 at par with the pay of direct recruits recruited on or after 1.1.2006 is concerned, it is clarified that the pay of those Railway servants who joined the Railway as direct recruits on or after 1.1.2006 is to be fixed as per Section II, Part ‘A’ of the First Schedule to the RS(RP) Rules, 2008 and the procedure of pay fixation is based on a specific recommendation of the Sixth Pay Commission, which has been accepted by the Government. As far as pay fixation in respect to those Railway servants who were already in service on 1.1.2006 is concerned, the same is to be done as per the provisions of Rule 7 of RS(RP) Rules, 2008 and in accordance with the fitment tables annexed with this Ministry’s letter No.PC-VI/2008/I/RSRP/1 dated 11.9.2008. (b) pay of those Railway servants who were already in service on 1.1.2006 can not be fixed with reference to the minimum entry pay prescribed for those who joined the Railways as direct recruits on or after 1.1.2006 as per Section II, Part ‘A’ of the First Schedule to the RS(RP) Rules, 2008. 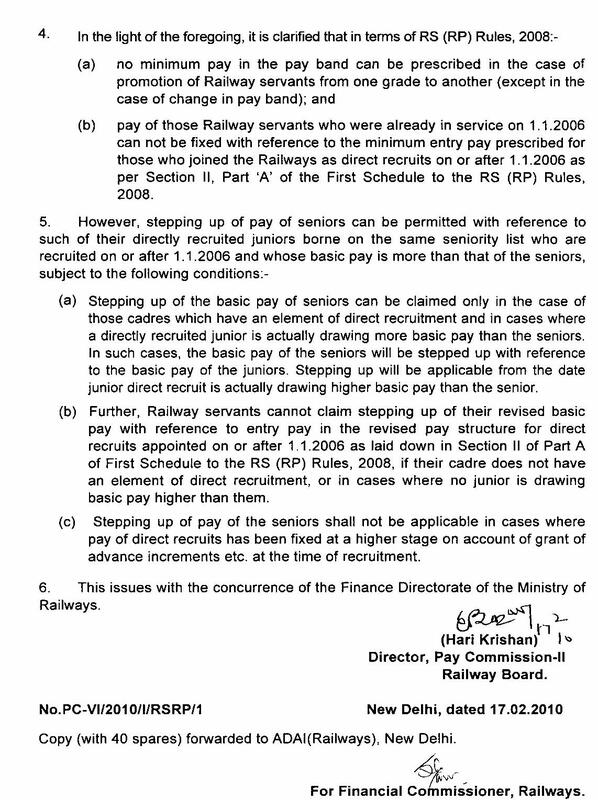 (b) Further, Railway servants cannot claim stepping up of their revised basic pay with reference to entry pay in the revised pay structure for direct recruits appointed on or after 1.1.2006 as laid down in Section II of Part A or First Schedule to the RS(RP) Rules, 2008, if their cadre does not have an element of direct recruitment, or in cases where no junior is drawing basic pay higher than them. The last National Sectt. Meeting inter alia discussed the possibility of a joint action programme with the AISGEF and AIDEF in the event of the Government introducing the PFRDA Bill and the new direct taxes code in the Budget session of the Parliament. While the AISGEF was to take a decision in the matter in their all India Conference which was scheduled to be held in the first week of February at Hyderabad, the AIDEF had promised us to discuss the issue in their organizational fora and revert back to us. So far we have not received any communication from the AIDEF. The All India Conference of the AISGEF had to be postponed due to the ongoing agitation in Andhra Pradesh. Hence, no finality could be reached on the proposal for organizing a day’s strike somewhere in March, 2010. Reintroduce the statutory defined benefit pension scheme for all CGEmployees recruited after .1.1.2004 by withdrawing the PFRDA Bill and amend the direct taxes code as demanded in the memorandum submitted by the Confederation of CGE and Workers. Enclosed herewith is a copy of the letter sent by the Confederation to the Hon’ble Finance Minister in response to the draft proposal placed on the website by the government. We submit the following Note for your kind consideration on the above subject. The Finance Act 2005 had withdrawn the deduction admissible under Section 16(1) of the Income tax Act, to the salaried tax payers of the country. We were unable to comprehend the logic or reasoning of this decision. We had been representing for the restoration of this deduction which would go a long way in reducing the tax burden of the salaried tax payers. The unjustified withdrawal of this deduction which had been in the statute book for more than a decade and half in one form or the other has resulted in increasing the tax burden of the wage earners in the country. We may also state in this connection that the salaried tax payers do pay their taxes to the Government without indulging in any evasion or avoidance and the tax on the salary earned by them is properly deducted at source by the employer. While the expenditure incurred by every tax payer in the country for the purpose of earning the income is allowed as an admissible deduction, no such deduction is now permitted while computing the taxable income from salary. Only the salaried tax payers are taken out of the ambit of this logical and genuine approach of taxation of income. We, therefore, request your good self on behalf of not only the Central Government employees but all salaried class of tax payers in the country to kindly consider re-introduction of the standard deduction which was to the extent of 30% of the total salary income of an individual. The enclosed Note presents the justification for the consideration of this request. Standard Deduction earlier allowed under Section 16(i) of the Income Tax Act, 1961 was withdrawn by the Finance Act 2005 with effect from the Asst. Year 2005-06. The basic premise on which the principle of taxation of income rests is that, it is not the gross income which is subjected to tax, but the net income arrived at after deducting the related expenses incurred in connection with earning such income, that are made the basis of taxation. This principle is observed while taxing all classes of incomes, viz., Income from Business & Profession, House Property, Other Sources, Capital Gains etc..
From the above, it would transpire that the Finance Act 2005 singled out the income chargeable under the head “Salary” to take away the deductions legitimately admissible for the expenses, which is wholly and exclusively incurred for earning the salary income. This is a clear case of deviation from the principle of equity enshrined in the Constitution and also the principles of taxation of income enshrined in the Income Tax Act which continues till its abolition in 2005. Ironically, identical Standard Deduction granted under Section 57(iia) in the case of income in the nature of family pension has been allowed to continue as such, while the Standard Deduction allowable in respect of income under the head “Salary” has been done away with. This is clearly discriminatory, unjust and as such should be restored in the Finance Act 2009 so as to bring about equity and justice. CGHS Delhi has been organizing CLAIM ADALAT for the last three years on zonal basis. This is a novel and unique method in the health sector to reach out to its beneficiaries to settle on spot any dispute arising out of the claims related to medical bills reimbursement. These beneficiaries are mostly the pensions of the Government of India who submit their claims with CGHS. CGHS North Zone is going to organize a claim Adalat on 27th February, Saturday, 2010 at the premises of the office of the Addl. Director CGHS North Zone situated at Shankar Road, New Razinder Nagar. This would be the third occasion when this Zone is going to hear the disputes/grievances about payments of medical bills. Beneficiaries are informed through Newspaper publications/information at the CGHS dispensary level to apply to the Addl. Director in case they have any problem so far as their bills are settled. However, claims which are already been examined and rejected will not be discussed in such across the table settlements. Applications received by post and by hand are documented and concerned files are opened to re-scrutinize the claims on the merit case to case basis under the ambit of CGHS rules and regulations. Cases are readied from before hand to enable the parties to settle the matter amicably to the satisfaction of the beneficiary. Most of the beneficiaries although had long been associated with the central government, are not acquainted with CGHS MRC rules and regulations. Misunderstanding and grievances thus crop up. Despite of all genuine and sincere efforts it is also not unlikely that some delay in disposal of the huge number of claims does occur. In such cases, these Adalat are ideal forum to settle on spot instead of long and cumbersome procedure of correspondence and files. Observers from Ministry are present to oversee the procedure to make it transparent and overboard. In this Adalat, officers who will represent CGHS are Addl. Director, OSD (reimbursement), PAO and Administrative officer while the Ministry would be represented by the Deputy Secretary, CGHS, Ministry of H&FW. This type of claim Adalat is in the principle of fast track decisions followed in judicial system and is usually done to clear the long pending cases for good. Main theme of these exercises is to make the officialdom transparent and rid of long pending cases. Unnecessary litigations may also be avoided by virtue of this type of out of the settlements. While industry is apprehensive of a possible rollback of the stimulus package, there could be some cheering news in the forthcoming Union Budget for salaried employees. The government is likely to increase the exemption limit for reimbursement against medical and travel expenses. A hike in the exemption limit for gratuity payment from the present Rs 3.5 lakh is also being considered. At present, reimbursement of medical expenses up to Rs 15,000 is tax-free. Any reimbursement above that is counted as income and taxed. Similarly, transport allowance is tax-free only up Rs 800 a month. These exemption limits were fixed 10 to 15 years back. The income-tax department is now considering an adequate increase to at least ensure that inflation in the years since is neutralised. In the last 10 years or so, the average price of commodities has almost doubled. Tax experts feel the present limit for reimbursement of medical expenses should be increased to Rs 50,000. Government sources refused to give any revised figure but said the matter is under consideration. Senior tax consultant Subhash Lakhotia showed another anomaly in the medical treatment provision. He said that if an employer incurs expenses on travel and stay abroad of the employee or any member of his family for medical treatment, then such expenditure is not treated as a perquisite. But this facility will be available only if the gross total income of the employee is below Rs 2 lakh. Due to this provision, the exemption in respect of medical treatment abroad is lost and cannot be used by any employee. Most employees who are entitled to this facility have income of more than Rs 2 lakh. To make this provision effective, experts feel, the government should change it to enable more employees to avail of it. Similarly, in 1997, the government had introduced a provision to allow an exemption of Rs 800 per month for a salaried employee on account of transport allowance granted by the employer. This transport allowance is given to meet the expenses for commuting between the employee’s residence and office. But, as the cost of transport has increased, the limit of Rs 800 has become inadequate, said Lakhotia. Therefore, the government is learnt to be considering an increase in the limit. Subject : Revision of hourly rates of incentive bonus and bonus factor of Workshops / PUs in respect of staff under CRJ pattern / GIS - Clarification. Ref: Board's letter of even no. dated 29.10.09.
i. Issue: Date of revision of incentive bonus in case of SSE / SE (Grade Pay 4600). Clarification: The revised in case of SSEs / SEs (Grade Pay 4600) will be effective from 1.6.09.
ii. Issue: Category of supervisors who are entitled for incentive. Clarification: SSEs / SEs directly supervising the staff working on the shop floor are entitled for payment of incentive bonus at a flat rate of 15% of the basic pay. For related issues, kindly refer to Board's letter No.99/M(Prod. )/814/35 dated 22.5.2000 and 16.3.2004.
iii. Issue: Guidelines for reduction of 5% in allowed time. Clarification: Workshops / PUs may reduce the normalized time for individual activity in such a manner that the overall allowed time for that activity is reduced by 5%. iv. Issue: Payment of incentive to staff and supervisors on getting the benefit of Modified Assured Career Progression (MACP). Clarification: Incentive payment should be decided on the basis of the post/designation held by the employee and the hourly rate/bonus factor corresponding to that post/designation. Subject:- Grant of incentive for acquiring higher qualification - Inclusion of additional qualifications/Review of the qualifications listed in the Annexure to this Department's OM No. 1/2/89-Estt (Pay-I) dated 9.4.99. The undersigned is directed to refer to this Department's OM of even number dated 28.4.2009 and reminders of even number dated 17.6.2009 and 20/8/2009 and 30.10.2009 calling for suggestions regarding addition / deletion of qualifications listed in the Annexure to this Department's OM dated 9.4.1999. All the Ministries/Departments are requested to furnish their considered views/suggestions in this regard to this Department within 30 days from the date of issuance of this OM. Subject:- Effect on modification/expunction of adverse remarks in the ACRs and upgradation/down-gradation of the overall grading in the ACRs prior to the period 2008-2009. The undersigned is directed to say that instructions were issued vide O.M. of even number dated 14th May, 2009 by which the complete APAR (previously known as ACR) including the overall grading and assessment of integrity shall be communicated to the concerned officer for representation if any, with effect from the reporting period 2008-09 which was to be initiated from 1.4.2008. Prior to that only adverse remarks in the ACR were required to be communicated for representation, if any. The then existing instructions further provided that the overall grading in the ACR should remain unchanged even after modification or expunction of the entire adverse remarks. It was left to the DPC to re-determine the overall grading if it considered that the expunction of such adverse remarks had so altered the quality of the ACR. The matter has been further considered and it has been decided that in those cases where the reckonable ACRs prior to the reporting period 2008-09 are to be considered in a future DPC on which the adverse remarks of Reporting I Reviewing / Accepting Authorities have been expunged or modified by the Competent Authority, the "overall grading" in the ACR be kept blank for appropriate re-grading by the DPCs. The existing grading shall be blocked in such cases. It has also been decided that where the authority has upgraded / downgraded the overall grading without giving sufficient reasons, the DPC shall treat such an exercise as non-estlinvalid. General terms, such as "I agree or disagree with the Reporting Officer / Reviewing Officer" used by the Reviewing I Accepting Authority shall not be construed as sufficient reason for upgrading / downgrading the overall grading given by the Reporting Authority 1 Reviewing Authority. The proposals for the DPC where ACRs upto the reporting period 2007-08 will be taken into account should specifically bring out these guidelines. 2. It is also made clear that past cases already decided will not be re-opened. Sub: Reservation for the Persons with Disabillties – Filling up of the backlog reserved vacancies through a Special Recruitment Drive. The undersigned is directed to invite attention to this Department’s O.M. of even number dated 27.11.2009 whereby a Special Recruitment Drive has been launched to fill up the backlog reserved vacancies of persons with disability. Attention is also invited to this Department’s O.M. No. 36035/8/2003-Estt(Res) dated 26th April, 2006, which, inter alia, required preparation of reservation roster registers and earmarking of reservation for persons with disabilities in accordance with the instructions contained in this Department’s O.M. No. 36035/3/2004-Estt(Res) dated 29.12.2005 starting from the year 1996. The OM provided that if some or all the vacancies so earmarked had not been filled by reservation and were filled by able bodied persons either for the reason that points of reservation had not been earmarked properly at the appropriate time or persons with disabilities did not become available, such unutilized reservation might be treated as havlng been carried forward. There may be some vacancies which might have become available for persons with disabilities in terms of the OM dated 264.2006 It has been decided to fill up all such vacancies during the Special Recruitment Drive referred to above. 2. All the Ministries/Departments etc, are requested to scrupuiously implement the above decision. On or about 12th January 2010, an officer in the Income Tax department, Mumbai, noticed that refunds had been issued from his jurisdiction without his knowledge or approval of his higher authorities. He immediately brought the matter to the notice of his superior officers. (i) Stop payment orders were issued. As a result, refund outgo in at least two cases could be prevented. (ii) Investigation and search action was undertaken by the Directorate of Income Tax (Investigation), Mumbai to detect the bank accounts to which the refunds had been credited and the beneficiaries. (iii) I-T investigators have identified the bank accounts, beneficiaries and some of the scamsters involved. (iv) Mumbai police and CBI Mumbai have been informed. a) All high value refunds issued during the current financial year will be cross-verified. b) The system of handling high value refunds will be replaced with a more robust and foolproof system. Subject:-Submission of Immovable Property Return for the year 2009 (as on 01.01.2010) - regarding. The undersigned is directed to say refer to the subject noted above and to say that Immovable Property Returns for the year 2009 (as on 1.1.2010) are required to be submitted by all the Group 'A' & Group 'B'(Gazetted/Non-Gaz.) officers in the prescribed proforma latest by 31st of January, 2010. All the Group 'A' CSS officers are requested to send a copy the IP Return which they would be submitting to their respective cadre/sub-cadre administration, to the CS-I Dvision also for our records. Dated the 30th September, 2009. In view of the utmost importance attached to the enhancement of women's status in all walks of life and to enable them to lead a normal family life as also to ensure the education and welfare of the ·children, guidelines were issued by DOP&T in O.M No. 28034/7/86-Estt. (A) dated 3.4.86 and No.28034/2/97-Estt. (A) dated 12.6.97 for posting of husband and wife who are in Government service, at the same station. Department had on 23.8.2004 issued instructions to all Mins.lDeptts. to follow the above guidelines in letter and spirit. 2. In the context of the need to make concerted efforts to increase representation of women in Central Government jobs, these guidelines have been reviewed to see whether the instructions could be made mandatory. It has been decided that when both spouses are in same Central Service or working in same Deptt. and if posts are available, they may mandatorily be posted at the same station. It is also necessary to make the provisions at Paras 3(iv) and (vi) of the a.M. dated 3.4.86 stronger as it is not always necessary that the service to which the spouse with longer service belongs has adequate number of posts and posting to the nearest station by either of the Department may become necessary. 3. On the basis of the 6th CPC Report, Govt. servants have already been allowed the facility of Child Care Leave which is admissible till the children attain 18 years of age. On similar lines, provisions of a.M. dated 12.6.97 have been amended. (i) Where the spouses belong to the same All India Service or two of the All India Services, namely lAS, IPS and Indian Forest Service (Group 'A'); The spouse may be transferred to the same cadre by providing for a cadre transfer of one spouse to the Cadre of the other spouse, on the request of the member of service subject to the member of service not being posted under this process to his/her home cadre. Postings within the Cadre will, of course, fall within the purview of the State Govt. (ii) Where one spouse belongs to one of the All India Services and the other spouse belongs' to one of the Central Services:- The cadre controlling authority of the Central Service may post the officer to the station or if there is no post in that station, to the State where the other spouse belonging to the All India service is posted. The spouse with the longer service at a station may apply to his/her appropriate cadre controlling authority and the said authority may post the said officer to the station or if there is no post in that station to the nearest station where the post exists. In case that authority, after consideration of the request, is not in a position to accede to the request, on the basis of non-availability of vacant post, the spouse with lesser service may apply to the appropriate cadre authority accordingly, and that authority will consider such requests for posting the said officer to the station or if there is no post in that station to the nearest station where the post exists. The spouse employed under the Public Sector Undertaking may apply to the competent authority and said authority may post the said officer to the station, or if there is no post under the PSU in that station, to the State where the other spouse is posted. The spouse employed under the PSU 'may apply to the competent authority and the said authority may post the officer to the station or if there is no post under the PSU in that station, to the station nearest to the station where the other spouse is posted. If, however, the request cannot be granted because the PSU has no post in the said station, then the spouse belonging to the Central Service may apply to the appropriate cadre controlling authority and the said authority may post the said officer to the station or if there is no post in that station, to the station nearest to the station where the spouse employed under PSU is posted. The spouse employed under the Central Govt. may apply to the competent authority and the competent authority may post the said officer to the station or if there is no post in that station to the State where the other spouse is posted. & wife, if working in the same Department and if the required level of post is available, should invariably be posted together in order to enable them to lead a normal family life and look after the welfare of their children especially till the children attain 18 years of age. This will not apply on appointment under the central Staffing Scheme. Where only wife is a Govt. servant, the above concessions would be applicable to the Govt. servant. 5. Complaints are sometimes received that even if posts are available in the station of posting of the spouse, the administrative authorities do not accommodate the employees citing administrative reasons. In all such cases, the cadre controlling authority should strive to post the employee at the station of the spouse and in case of inability to do so, specific reasons, therefor, may be communicated to the employee. 6. Although, normal channels of representations/complaints redressal mechanism exist in the Min.lDeptts., added safeguards to prevent noncompliance may be provided by ensuring that the complaints against nonadherence to the instructions are be decided by the authorities at least one level above the authorities which took the original decision when they are below the level of secretary to the Govt. of India/Head of the PSU concerned and all such representations are considered and disposed off in time bound manner.